Same as the 69 US 318 LA, or B series 361 Dodge Adventerer pickup 2-BBL Stromberg WW 2-barrel carburetor carb, ID number 3-223a. The 250 2V was only offered on the XY and XA model Falcons. For the XB, Ford reverted back to the ‘log’ manifold with a single barrel carb. The reason for this is unclear, but it may have been an attempt to encourage buyers up to move up to the new 302C V8 if they wanted more performance. 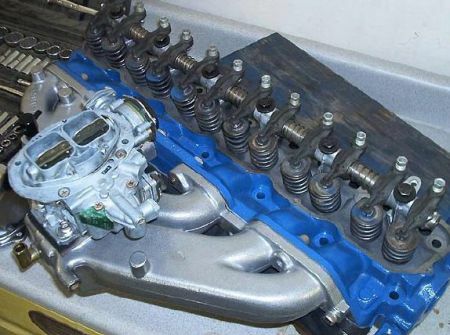 In the above photo, the inlet manifold has been fitted with a Holley two barrel carburettor. From the factory, the 250 2V got the same Stromberg WW two barrel carb as the 302ci V8’s, shown below. Cfm, top cover and base bolt spacing varied on others, but it was the same as the smaller Mopar 318 carb. 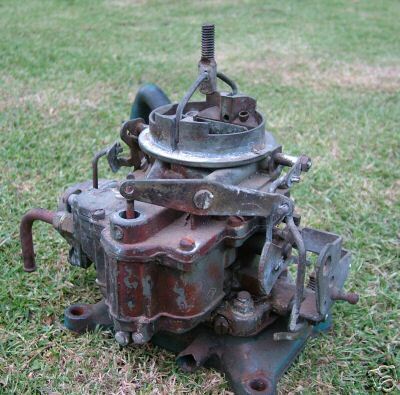 Its an ancient, cheap and nasty carb, made under liecence in Sydney Australia from Bendix Stromberg Corp, but was also found on 1953-1967 Plymouths, GM Buicks and GMC's and some Mopar products in the US, before the Email/Carter 2-bbl got used in the late sixties. Also Studebakers after the AMC era. You can do better than paying 1000 Australian on a numbers match M code 170 HP carb, as the basic Bendix Stromberg the most common 2-bbl carb made in Australia from 1968 to 1979, and one of the most common 2-bbls fro 1953 to 1967 in America. Just like the 170/188/200/221/250 Stromberg 1-bbl carb, which was actually an American Plymouth/AMC, Holdens 138-200 from 1963-1979. They even cast the name of Sydney as Sidney on early versions! The later 1-bbl 3.3 and 4.1 106 to 123 hp versions made by Bendix Australia were still making the 1-bbl versions move the XD Falcons, F100's and TF Cortina in 1982, so the hard parts are in abundance! So you can get a replacement 2-bbl Stromberg WW parts from the US as well as Australia, there was a WWC version for the Toilet challenged . 1955 D-55-1-2 Red Ram, D-55-3 Super Red Ram 270"
The Aussie versions were used on the following nine modles, there may have been others with it, like the 2-bbl Hemi or Slant six Aussie Valiants. 3.1969-1979 253, all of the H, L , V and U series Holdens (up to before the VC/WB Ute XT5 4.2 got the Rochester 4MV in 1980) 185 hp Gross or a lousy 117 hp DIN net rating with Dual Exhasts, even less with single exhast in VB Commodore. 4.1970-1974 F100 (and XY's with 302 Windsor) 200 hp rating I think. My neighbours NZ spec F100 had a factory Aussie market Windsor 302, and it was right hand drive 1974, way after the 1972 2-bbl 302C was an XY/XA/XC option. Every NZ 4.9 XC I've seen missed out on the Carter Themoquad, but I didn't see many. The GM version of the WW and the Ford version didn't have the Holley 2300/Rochester 2 Jet or 2100/2150 stud pattern, it was an oddball stud pattern. I have a WW250 2V base downstairs. A Redline adaptor was used for 350/500 conversions, I think.